The father-son relationship is a frequent film topic. That dynamic becomes even more complicated when the father has not one but two sons, and when he’s shown a clear favoritism throughout their lives to one over the other. In the rural setting that houses the Whipple family, patriarch Henry (Dennis Quaid) is a small-town businessman with one son, Grant (Patrick Stevens), who has a business sense but leaves home to travel around the world, and Dean (Zac Efron), who prefers racing cars to navigating the fields and selling his product. “At Any Price” explores both the nature of preserving a legacy and the unbreakable ties created by family. The Whipples’ story is a very familiar one, which finds Henry overextended in his work, always thinking about keeping his clients and in over his head in terms of what he knows he needs to deliver. While the town idolizes Grant for his monumental adventures, which make the local newspaper on a regular basis, the Whipple family feels his absence, particularly since Henry refuses to acknowledge that Dean’s passions lie elsewhere. Through a series of relatively predictable events, Henry and Dean find themselves connected in way that is more powerful and enduring than any business deal could ever be. 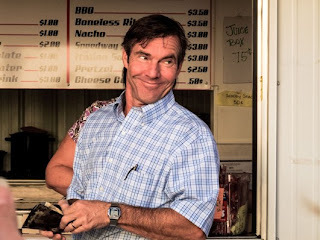 After watching Quaid aeach week on “Vegas” as grumpy Las Vegas sheriff Ralph Lamb, it’s refreshing to see him smile broadly and express genuine joy at the thought of a successful sale. Yet Quaid, who has turned in great performances in films as diverse as “Far from Heaven” and “The Parent Trap,” is overacting wildly here, turning his Southern businessman into a complete caricature, incapable of being taken seriously. Efron, who has grown up considerably and graduated from high school musicals to bona fide film work, responds ably but unspectacularly enough to a part that is thinly written. Kim Dickens, who portrays Henry’s wife Irene, is wasted in a part that does no justice to her standout work on “Treme.” The only notable member of the cast is Clancy Brown of “Carnivale” and “The Shawshank Redemption” fame, who delivers a heartfelt performance as Henry’s main competitor. Sacrificing family for business is not a revolutionary notion, yet this film tries to paint it as such, covering oft-visited territory and telling an all-too unoriginal story. What the film ultimately comes down to is a puzzling interpretation of moral integrity, and an attempt to legitimize its characters’ malignant actions as beneficial in the long run. Its depictions of ethics and family are at odds, and its effectiveness is diminished as a result. There is a decent idea here, but this particular telling leaves much to be desired.